After the first dropped points of the season, Texas United still leads the Week 5 standings with 10 points-one clear of expansion side AHFC Royals. Week 5 highlights included a Royals road win where they handed Brazos Valley their first loss of the season, FC Cleburne’s first win of the year and FC Houston’s home draw with previously undefeated Texas United. Week 6 will see five matches, including the second iteration of the Houston Derby between the Royals and FC Houston-this time at Houston’s home at Houston Baptist University, two challenging road games for Corpus Christi FC and FC Cleburne travelling to Houston for two weekend fixtures. Two second half goals from Brandon Cerda (Mansfield) and a penalty from Carlos Flores (Arlington-native and Midwestern State) led FC Cleburne to their first victory of the season (2-0) over AHFC Royals. An 89th minute goal from substitute Ben Davidson (Strake Jesuit High School/Houston) allowed Houston FC to share the points with Corpus Christi FC. The Sharks had taken a 2-1 lead into halftime from goals by Stefan Lukic and Antonio Balderas. The Houston FC first half goal was scored by defender Christian McArthur (and what a goal it was). If this is not PDL Goal of the Week, I definitely want to see the one that is. A 52nd minute goal, his second of the week, by Ben Davidson allowed Houston FC to draw with Texas United, the first time this season the Grande Prairie club has not taken maximum points this year. Texas United had taken the lead midway through the first half on the first goal of the season from Alex Egeonu (Irving). 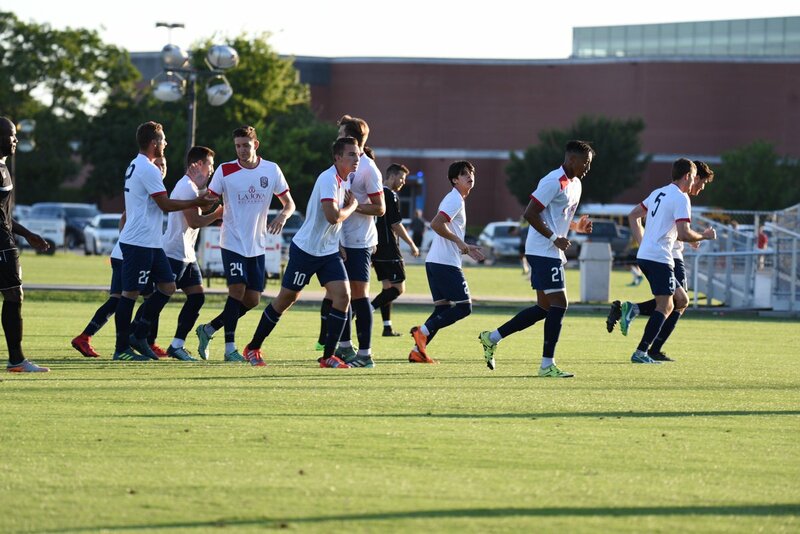 Two second-half penalty conversions, in the 51st and 82nd minute, from OKC Energy U23’s midfielder Louis Bennett were the difference in the 2-1 home victory over FC Cleburne. 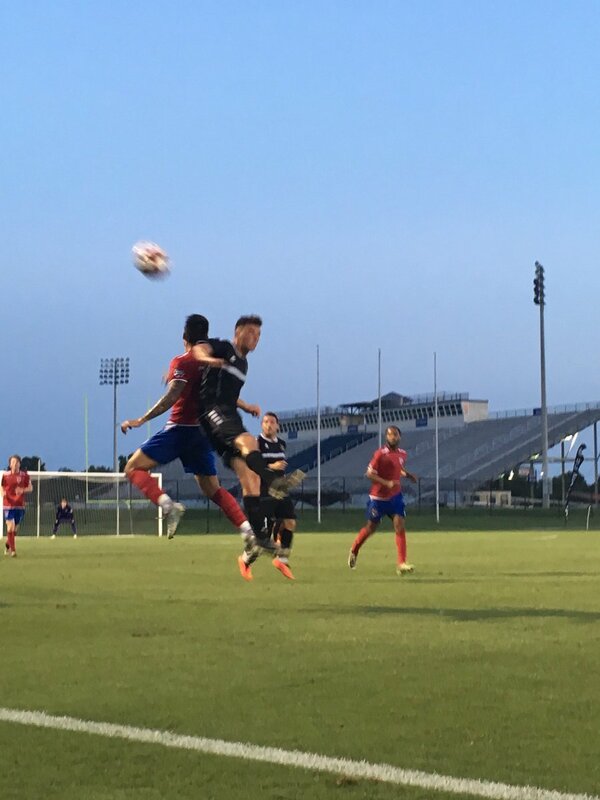 Carlos Flores temporarily leveled the match for Cleburne with a superb 62nd free kick, but it was not enough to prevent Energy U23 from earning their second victory of the year. AHFC Royals scored in the first minute and twice more in the first half, two by forward Johannes Oeksnevad, to lead the Royals to a decisive 4-2 victory over Brazos Valley Cavalry. Because both teams train in Houston, this was somewhat of a rivalry match. Down 3-1 at halftime, a 57th minute penalty conversion from Brazos Valley captain Josue Palomino (below) gave them hope. In the 82nd minute a goal from the Royals substitute Erwin Regules put the game out of reach, sending the Cavalry to their first loss of the season. Killian Colombie’s second of the season was the other goal scored by the Royals. In the match report by Maria Mcilwain in BrazosSports.com, Cavalry Head Coach James Clarkson discussed the his disappointment with the results.